Ellen DeGeneres: The Kennedy Center Mark Twain Prize aired on PBS stations nationwide on October 30, 2012. A lineup of top entertainers, including Kristin Chenoweth, Steve Harvey, Jimmy Kimmel, John Leguizamo, Jane Lynch, Jason Mraz, Lily Tomlin and others, saluted Ellen DeGeneres at the 15th Annual Kennedy Center Mark Twain Prize for American Humor on October 22, 2012. Ellen DeGeneres' distinctive comic voice has resonated with audiences from her first stand-up comedy appearances through her work today on television, in film and in the literary world. She has made a home for herself in the daytime arena with her hit syndicated talk show, The Ellen DeGeneres Show. The show entered its tenth season in September, fresh off winning the Daytime Emmy for "Outstanding Talk Show." During its nine seasons, the show has earned a total of 35 Daytime Emmy Awards. Additionally, DeGeneres has won 12 People's Choice Awards and most recently, the Teen Choice Award for "Choice Comedian" for a third consecutive year. Additionally, the show has won two Genesis Award and a GLAAD Media Award for "Outstanding Talk Show Episode." 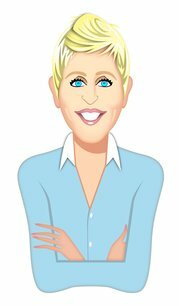 Ellen DeGeneres DeGeneres has been included in Forbes 100 Most Powerful Women and was also included in Entertainment Weekly's 50 Most Powerful Entertainers. She was honored with Television Week's Syndication Personality of the Year and has been included in Time magazine's 100 Most Influential People. She hosted the highly rated 79th Annual Academy Awards and was nominated for a Primetime Emmy Award for "Outstanding Individual Performance in a Variety or Music Program." In addition to hosting the Oscars, DeGeneres has hosted the Primetime Emmy Awards three times. Her performance hosting the 2001 awards show garnered her rave reviews for providing a perfect balance of wit with heartfelt emotion to the post-September 11th telecast audience. DeGeneres served as host for an array of industry events including the 38th and 39th Annual Grammy Awards, for which she earned an Emmy nomination. The best-selling author released her third book in October 2011 titled, Seriously...I'm Kidding, which includes a compilation of photos, quotes and stories from her life. Her second book, The Funny Thing Is...., comprised of the author's comedic short stories and essays hit the New York Times bestseller list upon its release. In 2005, DeGeneres was nominated for a Grammy Award for Best Comedy Album for the audio version of the book. Her first book, My Point...And I Do Have One, published in 1995, debuted at No. 1 on the New York Times bestseller list. DeGeneres' career began as an emcee at a local comedy club in her hometown of New Orleans, which led to national recognition in 1982 when her videotaped club performances won Showtime's "Funniest Person In America" honor. When DeGeneres moved to Los Angeles she filmed her first HBO Special, Young Comedians Reunion, then in 1986 Women of the Night. That same year, DeGeneres became the first female comedian to be summoned by Johnny Carson to sit down with him after her performance. DeGeneres began her acting career in television on Fox's sitcom, Open House. She moved on to ABC's Laurie Hill, prior to being offered a part on These Friends of Mine by ABC. After the first season, the show was renamed Ellen. Running from 1994 to 1998, the show garnered record ratings, with DeGeneres receiving Emmy nominations each season in the Best Actress category. In 1997, DeGeneres was the recipient of the coveted Peabody Award as well as earning an Emmy for writing the critically acclaimed "Puppy Episode" when her character came out as a gay woman to a record 46 million viewers. 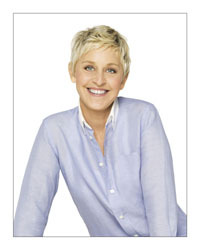 DeGeneres followed with the CBS sitcom, The Ellen Show, which ran from 2001 to 2002. In the course of producing and starring in Ellen, DeGeneres received numerous accolades including The People's Choice Award in 1995, two Golden Globe nominations and two Screen Actors Guild nominations. Other television credits include Executive Producing and starring with Sharon Stone in the Emmy nominated If These Walls Could Talk II for HBO as well as a guest appearance on The Larry Sanders Show, for which she received another Emmy nomination. DeGeneres also served as the fourth judge on American Idol during its ninth season. The judging panel included, Simon Cowell, Randy Jackson and Kara DioGuardi. DeGeneres has also been successful in her feature film work. DeGeneres scored unprecedented popular and critical response to her character, Dory, the fish with extreme short-term memory, in the blockbuster animated feature film, Finding Nemo. DeGeneres' feature film credits include EDTV for director Ron Howard, Mr. Wrong, The Love Letter for Dreamworks, New Regency's Goodbye Lover, and Coneheads.